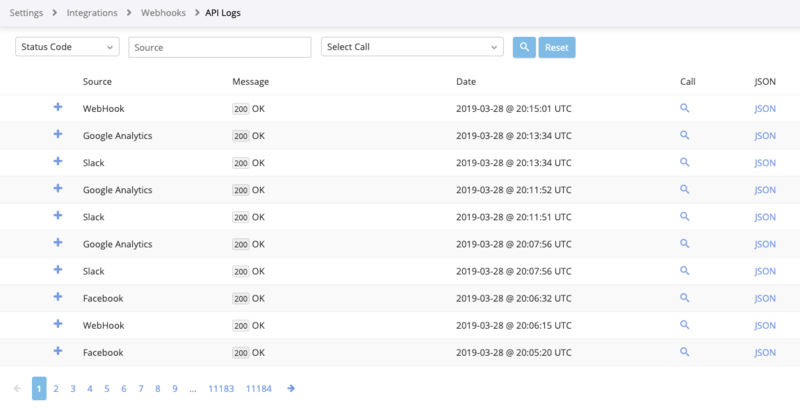 The API Logs are a comprehensive list of API requests related to your CallTrackingMetrics account. Any integrations or webhooks you’re using will have a log of requests that can be viewed here. This page is useful for monitoring activity and troubleshooting errors. The API Logs can be accessed via quick links from many integration settings pages or by navigating directly to https://app.calltrackingmetrics.com/api_logs. JSON: a link to the JSON file for the associated activity. Each row can be expanded using the + symbol to view the full details of the request. Using the available filters, you can refine the log view by a particular status code, source, or call from your call log.